In a tiny apartment on Manhattan’s Upper East Side with fabric and in-progress costumes filling every inch of available space, Emily Riggins decided to explore a new career path. Since graduating with a degree in theatre from Bucknell University, Emily found success designing and sewing costumes for theaters in New York City and at the Santa Fe Opera in New Mexico. But it was time for a change. Her career in costume design had started with an entry-level job as a draper’s assistant on Broadway shows. The position was an excellent networking opportunity and after one year, she earned a prestigious internship as a costume design assistant at the Juilliard School, which led to further opportunities collaborating with the Metropolitan Opera and a two summer stint with the Santa Fe Opera. She was ready for a new challenge but wanted to pivot away from working in theatre. “I’d tried every type of job from technical to design and none quite felt like ‘it,’” she says. Growing up watching her dad run a third-generation family business, Emily always had an interest in starting her own company. An MBA seemed like the best way to change career paths and explore the possibilities of opening her own business. With one campus visit, the Drexel LeBow MBA program and available resources made a strong impression. After gathering as much information and advice as possible, she applied for a C-Suite Co-op with Agile Therapeutics, a pharmaceutical company that specializes in women’s health. The position appealed to her because Agile Therapeutics was still in the process of bringing their first product to market, so the branding and marketing were still in development. She interviewed and was offered a position working under the company’s chief commercial officer. Right away she noticed that her work at Agile Therapeutics dovetailed with what she was studying in the new product development course. It was also the perfect opportunity to utilize her skills and knowledge in the areas of design and innovation in a new field. “People at Agile really valued my unique background. I was afraid I’d be a square peg in a round hole, but I fit right in,” she says. In one of her earliest projects, she was tasked with writing a script for an animated video explaining Agile’s products, manufacturing process and patient benefits to potential investors. The project proved to be a tremendous learning experience. With the opportunity to speak with executives in every department, she quickly gained a thorough understanding of how the company operated and what it had to offer. 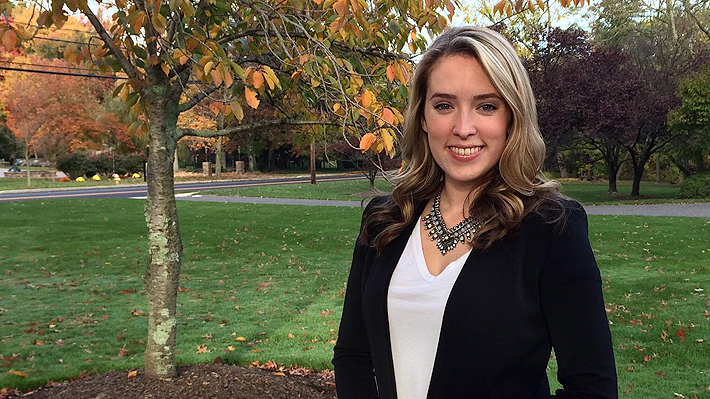 By the time her co-op ended, Emily had a clear idea what career path she wanted to pursue. Agile Therapeutics also knew they didn’t want to lose her creativity and drive and offered her a position as an associate product manager upon graduation. She’s currently working with them three days a week until January, when she’ll begin full time. Over the summer, LeBow’s full-time MBA students embarked on experiential opportunities including C-Suite Co-ops and internships. Several students’ experiences turned into full-time jobs. LeBow sophomore Shania Smith will join Johnson & Johnson for her spring/summer co-op after attending the Developing Diverse Leaders of Tomorrow program.